Steve Mehta, already an accomplished mediator and ADR (Alternative Dispute Resolution) blogger, has decided to take on the title of author for his latest project. 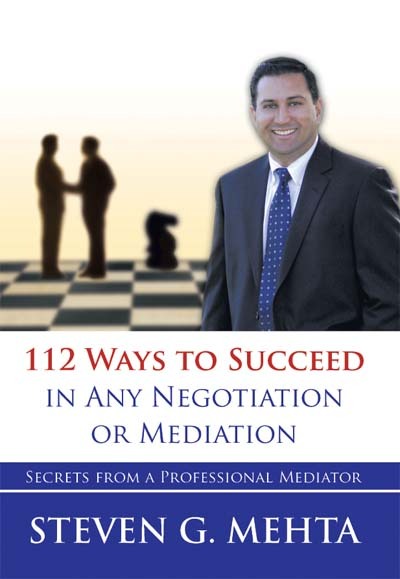 112 Ways to Succeed in Any Negotiation or Mediation is the title of his debut as an author and to those who know him, it comes as no surprise that Mehta has provided us with a valuable resource. The 200 page book gives 112 suggested practices in a brief format for mediators and negotiators. Most are less than a single page in length with only a handful exceeding one page. Mehta uses a simple formula for each of his tips: First, he explains it in relation to the ADR field. Next, he provides a combination of real life personal examples and explains the tip’s applications in everyday, non-ADR settings. Finally, he explains the benefits of the suggested practice…. www.Mediate.com published the entire book review, so if you are interested in reading the rest of the review, please visit their site (clicking the above link) or go straight to the page by click [here]. I put together this image as a follow up to this posting in being a reflective practitioner. I know sometimes being able to see a drawing helps me better understand something so I hope it helps you. Practice what you preach. Be the change you want to see in others. Change starts with you. The above statements are all commonly heard throughout our ADR lives. Today, I suggest reflecting on them in the capacity of being “Cool As A Cucumber”. Before and during heated exchanges or outburst in a negotiation, as the negotiator and possibly more importantly as the mediator, displaying a calm and cool demeanor has the ability to de-escalate the situation. Based on personal experience it works. It works in violent confrontations, neighbor disputes, and co-worker misunderstandings (plus everything else!). Methods I use to try and prevent myself from getting caught up in a heated exchange is preparing for what to do if someone tries to bait me, make accusations or be confrontational. Preparing myself helps diminish the opportunity for negative situations to arise as I firmly believe exhibiting a cooperative and collaborative approach is contagious. I remind myself to remember to respond not react. In Beyond Reason: Using Emotions as You Negotiate, Fisher and Shapiro mention possibly options to cool your emotional temperature. – Slowly count back from ten. – Breathe deeply three times, in through your nose, out through your mouth. – Allow yourself to sit comfortably in silence for a moment. – Ask yourself what is at stake for you. – Adopt a relaxed position: sit back, cross your ankles, let your hands rest on your lap or table. – Let upsetting or offensive comments fly by and hit the wall behind you. For those interested in learning and possibly practicing more breathing and relaxation techniques, within the next month I am going to post a brief introduction to meditation and some simple exercises that anyone, regardless of religious preference, can use to help be mindful during their mediations and negotiations while also acknowledging the emotions that are present in both yourself and the other party(s). If you find Fisher and Shapiro’s tips helpful, I suggest purchasing their book to get the full list mentioned above as well as other powerful advice for handling emotions during negotiations or mediations. For those interested in more meditation practices and techniques, check back at Enjoy Mediation or feel free to email me [mediator.jeff@gmail.com] and I would be happy to give tips that have worked for me as well as books I recommend. Finally, who would ever have thought a cucumber would be in your ADR toolbox? Now you will never look at a cucumber the same way again! Roger Fisher and Daniel Shapiro, Beyond Reason: Using Emotions As You Negotiate (New York: Penguin Books, 2005) 150. 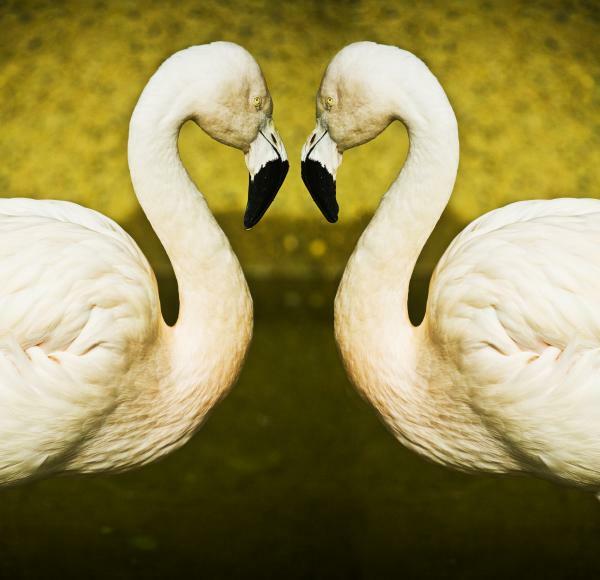 The Reflective Practitioner: Do I Understand Myself? Are you a reflective practitioner? There are many benefits to the various types of conflict resolvers- mediators, negotiators, conflict coaches, conflict skills trainers, ombudsman, etc. Before going further into the benefits and examples of how to be a reflective practitioner, I think it is best to define it. At a recent lecture I attended given by Bernie Mayer*, he mentioned a reflective practitioner is someone who looks back on an interaction and tries to understand what you did. You check to see if there is a disconnect between your actions and the theory. The theory is that which explains how certain actions in similar situations will result in either harmful or beneficial results for you, the other party(s) or a combination of both (see image below). A powerful comment Meyer said still distinctly stands out from the other powerful comments he made during the talk: It is in this disconnect that lies a wealth of learning. The only way we can obtain the benefits and wealth he refers to is by taking the time to stop and reflect. What have we learned in the books and training and how does that compare to what we had just done? Are they both in sync or is there a disconnect? An example of that reflection is during a negotiation I was involved in with a group of protesters. The leaders of the group, which totaled several hundred people including women and children, told me they wanted to march to a certain area that was off limits while knowing the result would be the protesters being arrested. They told me that was their ‘final decision’. I could have walked away, letting them maintain their autonomy and stick with their choice. However, I decided to continue to negotiate with them by first taking a deep breath and then a few more letting everyone have an opportunity to self reflect in that current moment. Then I asked many reality checking type questions among other tools in my mediator’s toolbox. Ultimately after many stressful minutes that felt like hours, a successful resolution was achieved with no one being arrested and some of their interests still being met. The disconnect between the theory of me allowing them to stick with their choice and the actions I took contradicting that theory provided me with a wealth of information and knowledge. The lesson I took away after reflecting on that particular situation was that knowing theory is imperative for a practitioner. Equally important is as a practitioner, you must try the theories out for yourself to see how they work in actual situations. Of course other theories come into play in my example such as ‘is a final decision ever final?’ but the point I want to stress is the way to grow as a reflective practitioner is through this analysis. • Integrate our espoused theory and theory in action. Meyer’s talk reminded me that in order for me to be a successful mediator, it is crucial for me to be a successful reflective practitioner. Including the tips mentioned above into my practice are part of the process in ensuring that I have understood myself. One of the many ‘evil’ traits that frequently are displayed by parties in mediation is selective perception. People form their own idea of an event or situation and then anything that is said or information that arises after the fact which contradicts their opinion is dismissed or ignored. I say it is ‘evil’ as selective perception hinders the process of getting the parties to work in a collaborative and cooperative mindset. Selective perception does not allow the party to see and understand the interests of the other party. As the mediator it is important to realize this is being displayed. I think it is important for a mediator to know the names of behaviors and actions such as selective perception and other attribution biases listed [here]. Sure, a good mediator can help move the party away from a hindering position while not knowing the name of the act but it makes things easier knowing it because then it will be easier to respond accordingly. Step one is naming it, while step two would be properly responding. Getting the party to open up more about their thought process behind their position can not only help display a potential selective perception to you, but it then can also be picked up by him or her- the one displaying it. If the person does not pick up on it, and then after the other party presents their side of the event, many times, what I do is ask the first party something is along the lines of, “It sounds like party B viewed the event/situation different to way you described it. Now that you have heard his/her version, what do you think?” It might seem unnatural to ask an open-ended question but by doing it this way it diminishes the chance for a one word answer. The more they talk, the more they think about what they are saying and going to say. A note I would like to mention is I do this with both parties. If I were to do this type of questioning with just one party it could present the illusion I am picking sides and trying to get one side to change their mind. Checking in with party A after party B has spoken (and vice versa) is a way to ensure they are effectively listening as well as opening their mind to the other side’s viewpoint. Promoting empathy is crucial to assist the party(s) move away from their selective perception. I tend to stress that understanding the other side’s point of view is not agreeing with them. In order for an agreement to be reached in mediation, I tell them both sides have to agree. As simple and possibly silly it might sound, I think reminding the parties if an agreement is possible of being achieved, each one needs to be able to understand the other. Enjoy and I hope this little ‘golden nugget’ helps. The mediation process is sometimes followed in the steps you had all planned out and sometimes it goes in a completely different direction. Regardless, planning ahead and making sure you have each step in your mind can be extremely beneficial. The purpose of making sure you have a road map is not just to help keep you on track but also the parties. The mediation is an attempt to find a mutually beneficial solution to the dispute/conflict the two parties are having that is better than their alternative. As the mediator, not having the mindset of the proper order mentioned above could be a disaster. Not only not having them in order could be detrimental, but also forgetting certain stages can also have an adverse effect. Would you board a plane under the following conditions? · The passengers are not sure why they are on this plane. · The aircraft does not have effective radar for direction finding. · The aircraft does not have mechanisms for dealing with unexpected turbulence. · The flight crewmembers are not clear about their respective roles and responsibilities. After I first read that, I found it funny because obviously one would never board a plane under any of those conditions. It could be easily overlooked giving the parties an explanation of how the mediation will proceed so hopefully this little reminder will do just that- remind you to keep the parties informed. The Ombuds Office uses the acronym OARR- Outcomes, Agenda, Roles and Responsibilities, and Rules as a way to properly prepare yourself and others (read more on OARR here). Incorporating OARR in your opening statement could help accomplish the task of ensuring the parities know how things will go. The best way I do this is via the opening statement and can easily be done in a few sentences taking only a minute. It is easy to do, but also easy to forget. As conflict resolvers, we are suppose to notice the things that others can not because we are trained to do so. We are also trained in knowing the terms of certain traits, characteristics and actions. Knowing these terms does not make one smarter than the other, or display a sense of superior mediator skills when compared to others but rather I look at it as an additional tool in the mediator’s toolbox. Knowing these terms and also being able to identify them when being displayed in ‘real time’ is crucial as a conflict resolver. Why? One of the first tasks we are faced with is diagnosing the conflict. When looking at the circle of conflict [read more here], understanding terms such as attribution bias can help you understand the people involved and the actions they have taken. When you do something, it is because of the circumstances of the situation but when someone else does it, it is because of their disposition. Believing everyone else thinks the same way they do. Assuming your interests are are not compatible with the other party. Thinking someone acted a certain way to purposely have a negative impact on you. You can read about many more of them [here] and read all about the cognitive biases [here]. So you might be asking again, why bother? I am not suggesting when mediating an issue between two parties, if you see one person displaying the actor-observer bias that you call them out on it. What I think can help is by recognizing what it is that they are doing will allow you to properly decide on a method that can assist the party to move away from that bias and move in a positive direction. This short posting by no means is intend to be a lesson on attribution biases and cognitive bias. If this has sparked your interested, I suggest researching articles and papers to gain further insight at such sites like Beyond Intractability and CRINFO. For all the negotiators and mediators- you know the saying of the best way to promote a practice (effective listening, communication skills, etc.) is to set the example by doing it yourself? The study included 103 participants. Half were given written instructions on how to handle stress at work; the others, including Waugh, were taught techniques to cultivate mindfulness, such as yoga poses, breathing methods, stretches and meditation — all designed to help workers cope with too many e-mails, ringing phones and the occasional nasty co-worker. So, if you want to remove stress from yourself as well as from the parties in your mediation, some type of mindfulness practice might help. You are currently browsing the archives for the negotiation tips category.